At the end of day two, the Earth was a water-world. Earth’s waters were located in two areas: ice above the atmosphere and a global ocean below. A spreading atmosphere (raqiya shamayim) formed on day two between the two water areas, as per the Genesis text. Proverbs 8:27-28 speaks of God’s wisdom in creation, “when He intensely made rigid the skies above, when the fountains of the deep (tehom) were becoming strong.” This seems to refer to surface geysers that ejected water into space forming ice rings around the planet. Please read the analysis of the Hebrew text for Day Two on this web site. The picture of the Earth on day two shows the world-wide ocean, clouds and several plumes ejecting into space where they are forming ice rings. 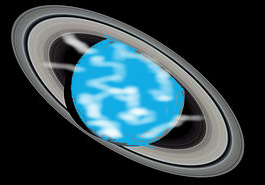 This was adapted from a NASA picture of Saturn. In that era, the sea may have been brown since we observe that ancient atoms shone at much lower frequencies than modern atoms. Day three divides into two parts, each beginning with the statement: Elohim continues to say (imperfect verbs). The first section of this day deals with water. Verse nine: and Elohim continued to say, let the waters under the atmospheric sky continue to gather together into one place and the dry land continue to appear and it is becoming so. Where did the surface waters go when they continued to gather into one place? There are several possibilities. 1. Perhaps they continued to be gathered into ice rings around the planet. If that were the case, there would be no surface waters left since the text says that the waters under the atmosphere continued to gather into one place. 2. Perhaps they were gathered into several oceans allowing several continents to appear. However, the word for waters is plural while the earth-word is singular. Perhaps the waters gathered into many large lakes within a single, world-wide continent. That also does not fit the text! He continues to command the waters to come together into one (achad) place. 3. The surface waters seeped into one place, underground, called the tehom in Hebrew. This is supported by other passages. 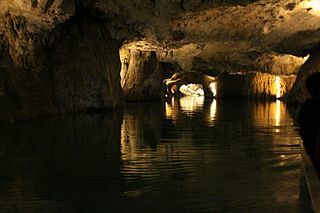 Picture of the Saint Leonard underground lake in Switzerland is under GNU free documentation license by Borsic at en.wikipedia. Genesis 49:25 mentions the tehom (the deep that lies under). During Noah’s cataclysm, the springs of the great tehom (the underground, primordial seas) were rent and the water gushed onto the surface. It did not rain during the garden Eden phase, which would be true it their were no surface oceans (Genesis 2:4-14). During the garden phase, water came out of the ground to water the earth and rivers divided and flowed around the land, not into surface seas. The reason it did not rain is that surface oceans did not exist in that era. The modern continents were clearly once together, since they fit together on a much smaller globe without major seas. A global expansion seam runs through every ocean with the youngest crust next to the volcanic seam and the oldest next to the continents. The modern seafloor is basaltic, dense and fine grained, which prevents water from seeping into the earth, as rain does on the land. If the first world-wide sea was warm and acidic, it would gradually seep underground, opening up cracks that would grow into great caverns into which the waters (plural) would gather into one place so that the dry land continued to appear. We see evidence that the continents were once covered with shallow seas. Layers of chalk and limestone show that sea creatures lived in a water environment on the continents. The modern ocean depths are geologically distinct from continents, made of dense basalt seafloor, without the thick layers of sedimentary rocks found on the continents. The continental Burgess Shale fossil bed contains millions of underwater creatures rapidly buried in an avalanche of fine mud. Their soft body parts and even their burrows in the floor of the ancient sea, are preserved. Evidently theses creatures died suddenly when the great deep (tehom) collapsed during Noah’s cataclysm. Marine fossils on all continents are often overlaid with distinctly different rocks that contains the fossils of ancient land animals. This fits the text, that the seas were gathered into one place, under ground seas, that latter teemed with life. Verse ten, and Elohim continued to name the dry land “earth” and completed calling the gathering of waters “seas.” The continual calling of the dry land suggests continuing geologic activity. The completed naming of the gathered-together waters suggests a more static condition, the seas remained underground. Verse eleven, begins the second part of day three. Elohim continues to command the ground to continue to sprout vegetation and trees that were to continually produce seeds that actively bring forth fruit, whose seed is in itself and after its kind, and it was so. Verse twelve repeats the commands of verse eleven to emphasize that God’s continuing commands produced results emanating from the inanimate ground. The ground continued to sprout vegetation yielding (in unbroken continuity) seeds and trees (actively and in unbroken continuity) bearing fruit after its kind. God continued to see that it was good. Verse 13, the evening and the morning were day three. The activities of the first phase refer to vast geological events as water seeped underground and was gathered into one place. During the second phase, trees grew up out of the ground and continued, in unbroken continuity, to bring forth fruit. The Hebrew text does not support one-time commands or short duration days, as in the traditional Latin text. Yet both phases of this day added up to a single evening and morning, day three. 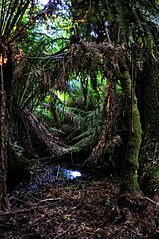 This photo of a primordial fern forest (preserved in Australia) is under a Creative Commons Attribution Share-Alike license by wikipedia user russavia. Was day three a 24-hour day? Hours had not yet been invented when Moses wrote Genesis. The notion that time exists, is measurable or is linear did not become a mindset until 3,000 years after Moses. Ancient people looked back on the first generations, wishing that they had lived in that golden age. Jacob was following the accepted thinking of his era when he said that his days and years were shorter and worse than those of his fathers (Genesis 47:9). The Greek poet Hesiod explained the continuing degeneration of life through gold, silver, heroic, bronze and iron generations. He moaned that he was part of the iron generation that never stopped laboring by day and dying by night. He expected that this degeneration would continue until children would be born with gray temples. The notion that the duration of life continued to decrease as everything degenerates was part of the world view of all ancient people. The Bible mentions the vast antiquity of the Earth and the eon ages of the earliest people. Yet the genealogies only add up to about 4000 years until the coming of Christ. This is not a contradiction when we accept their world view, that days and years are both accelerating. Earth is both old and young, old in age and young in rotations. The next day, day four, is the most important for us today as it confirms a literal creation account, since we observe its events happening long ago with telescopes.